Elliot Ackerman, as much as any contemporary veteran, has turned himself into a working professional author. With three novels in three years published by prestigious publishing houses and a collection of journalism and essays on the way, he’s making the rest of the veteran war-writing crew look a little sluggish, as if they were struggling to generate sellable story ideas. Time will tell who is the Tim O’Brien of the current cohort of war authors, but Ackerman is well on his way to being its Robert Olen Butler: the author of a steady stream of distinctive war-related fiction; books that fuse contemporary concerns with literary antecedents and private vision, that may be more loss-leaders than cash-cows for their publishers, but cumulatively adding up to a successful career and a laudable body-of-work. Ackerman’s latest work-of-fiction, Waiting for Eden, is novella-length, so not as tight and focused as a short-story nor as expansive as a novel. Shorting commentary, context and portrayal of social milieu while still taking time to reveal its secrets and generate impact, Waiting for Eden aims for evocativeness rather than detail as it presents the story of a grievously wounded and near-comatose Iraq veteran lying in a San Antonio hospital bed years after his wounding. The veteran, Eden Malcolm by name, is kept alive by the miracles of medicine and the refusal of his wife Mary to let doctors pull the plug on him. Eden in this regard resembles the protagonist of Dalton Trumbo’s acclaimed novel Johnny Got His Gun, published in 1938, about a World War I quadruple-amputee trapped alone with his thoughts inside his mangled body. Waiting for Eden is narrated by Eden’s Marine Corps buddy, an unnamed friend killed in the same IED explosion that injures Eden and who now tells the story from beyond the grave. The parallels between Waiting for Eden and Johnny Got His Gun have been noted by reviewers, but no one, to my knowledge, has noticed the similarity of the narration to Larry Heinemann’s 1987 National Book Award-winning Vietnam War novel Paco’s Story, which is related by the collective voice of the dead soldiers killed in a big battle that leaves the title character physically disabled and mentally anguished. -Phil Klay might philosophize about the ethics of life preservation and the oaths soldiers and families make to each other unto eternity. -Matt Gallagher might infuse the story with self-deprecating humor and existential bemusement. -Will Mackin might have a field day describing the porous boundaries between life and death. I want you to understand Mary and what she did. But I don’t know if you will. You’ve got to wonder if in the end you’d make the same choice, circumstances being similar, or even the same, God help you. In other words, the focus is on Mary, a problematic care-taker of her disabled husband and object of fascination and desire for the narrator, and it’s also a referendum on the narrator’s own thoughts and actions. It’s too soon after publication to reveal key plot details and discuss the story’s finale, but events before Iraq and after her husband’s wounding reveal that Mary’s choices and motives in regard to Eden are not exactly beyond reproach, nor are the narrator’s. Without giving away too much, let’s just say marital dissatisfaction and sexual impotence are issues, and matters of infidelity and paternity also come into play. The narrator’s intent (and I am assuming Ackerman’s too) is to save Mary and himself from harsh judgment, which is cool by me. The issue is complicated, however, by the narrator’s unreliability, his failure to clarify important plot points, and most of all, his failure or inability to offer fulsome portraits of Mary’s thoughts, though he is quite omniscient about other aspects of the story he tells. The problem is compounded by the fact that the narrator is a disembodied voice, not a ghost who interjects himself in the lives of the living, and Mary isolates herself from family, hometown, friends, fellow military spouses, medical care-givers, and even her daughter, which makes it hard to evaluate them in the context of social relations. Readers who feel they don’t have enough information to properly “understand” Mary and “what she did” might be left in a perplexed state by Waiting for Eden, which I believe is by design. Whether they approve of Mary and the narrator or not, readers will certainly be eager to discuss their ideas with other readers, which any author should welcome, and which I would certainly enjoy doing over a beer or two, if anyone’s interested. 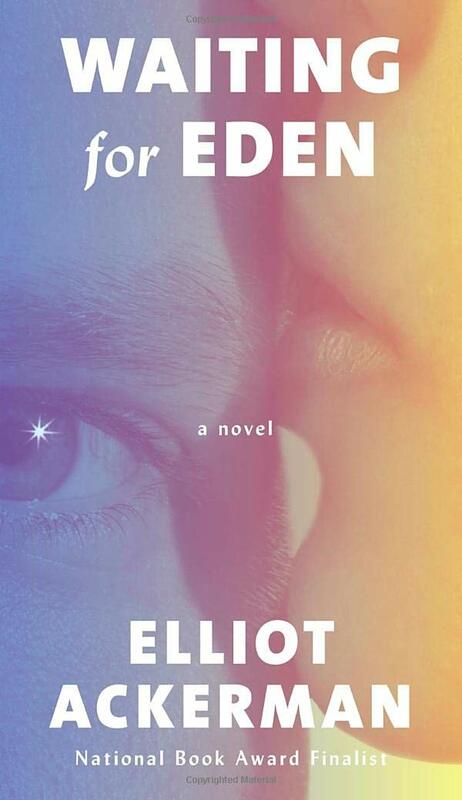 To situate Ackerman once more among his war-writer peers, Waiting for Eden explores the precincts of military marriage also patrolled by Siobhan Fallon. Fallon’s latest novel, The Confusion of Languages, features a character much like Waiting for Eden’s narrator–in Fallon’s case, a self-important male Army officer eager to preserve plausible deniability that he’s not your average, ordinary horndog with the hots for his best friend’s wife. Fallon’s best stories—“Leave,” “The Last Stand,” and “Tips for a Smooth Transition”—feature military couples in scenes set not just in any domestic space, but in the “rank sweat of an enseamed bed,” as Hamlet puts it, where the jealousy, resentment, and pay-back meters can ping off the charts. A great line from the movie version of Cat on a Hot Tin Roof spoken by the family matriarch, Big Mama, played by Judith Anderson, helps define the parameters of Waiting for Eden‘s odd ménage-à-trois and the centrality of the hospital bed where all the action happens, or doesn’t happen. While sitting on her daughter-in-law’s bed, Big Mama barks at Elizabeth Taylor’s Maggie-the-Cat character, who is married to Big Mama’s dysfunctional son Brick, played by Paul Newman: “You’re childless and my son drinks, and the problem starts right here,” at the same time slapping the unhappy couple’s mattress. Brick, it turns out, pines for his childhood friend Skipper, who has committed suicide after Maggie-the-Cat attempts to seduce him in order to ruin his friendship with Brick, which she resents. Complicated, yes, but something of the same is at work in Waiting for Eden. Eden’s hospital bed, haunted by the narrator’s vigil, serves, if we can borrow from William Blake, as “the Marriage hearse” for Eden and Mary’s ruptured dream of conjugal bliss and fruitful procreation. The romantic triangle formed by Mary, Eden, and the narrator also nicely illustrates literary critic Eve Kosofsky Sedgwick’s theory of “homosociality”: one deal-e-o going down is the psychodrama of the two men, locked in passive-aggressive one-upmanship manifested as desire for Mary, which is quickly transformed into dependence on her, and not just need for her body and approval, but for very existence. In a startlingly apt description, Benjamin Busch writes of Fallon’s “worried imagination,” and in many of her stories it’s not wives worrying about their husband’s fidelity that’s the issue, but wives worrying about their own potential for betrayal, along with the evident ability they have to emotionally crush their naïve, oblivious, trusting, and child-like husbands, should they choose to. This sentiment also informs Waiting for Eden. Ackerman’s achievement is tracing the narrator’s growing respect for Mary’s increasing consciousness of the power she holds over the men in her life, and their death, while moving the reader to understand and respect her growing awareness, too. That’s an enigmatic, perhaps not entirely helpful way to close this invitation to read Waiting for Eden, which I urge you to accept nonetheless. The book ends (as does Benjamin Busch’s memoir Dust to Dust, by the by) by quoting the final lines of John Milton’s Paradise Lost, which describe Adam and Eve, sadder but wiser after Eve eats the apple, leaving the Garden of Eden on “thir solitarie way.” It’s a stirring image, but its exact relation to the story Waiting for Eden tells is one more thing we can talk about when we have that beer together. Elliot Ackerman, Waiting for Eden. Alfred A. Knopf, 2018. This entry was posted on December 11, 2018 at 12:35 pm and is filed under Art and War. You can subscribe via RSS 2.0 feed to this post's comments.